The Motive Shock 2 Ball Tote features rugged construction with plenty of storage. The main compartment has room for 2 bowling balls, shoes, and more. In addition, the bag boasts 2 large zippered storage compartments with plenty of room for a couple of bottles of Power Gel®, a towel, and other accessories (all sold separately). Rugged tote handle and padded shoulder strap for convenient transport. Yes, it will fit in a locker. How many accessory pockets does this bag have? It will have 3 accessory pockets for this tote. 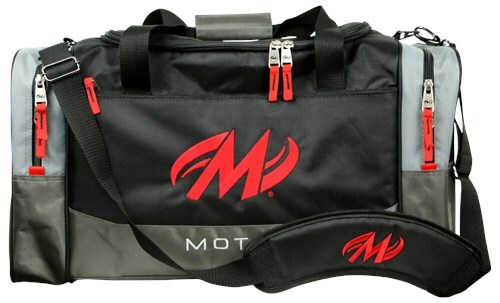 Due to the time it takes to produce the Motiv Shock Double Tote Black ball it will ship in immediately. We cannot ship this ball outside the United States.